The full moon of Jan. 15 partially blocks the sun, causing an eclipse visible in Africa and Asia. Because it is close to apogee, the moon is too small in the sky to ever block the sun completely, and no total eclipse occurs. Instead, folks on a path stretching from Uganda and Kenya across the Indian Ocean to Sri Lanka, Burma, and China see an annular eclipse. 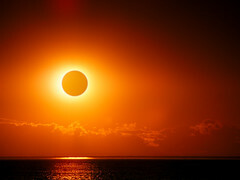 The moon will appear to be completely inside the sun’s disk with a ring of sun around it. At about 6 p.m. on Saturday, Jan. 2, the Earth came to perihelion. This means it was as close to the sun as possible—about 147 million km away (Earth is about 152 million km from the sun in July). This is not enough of a difference to influence our weather. Earth’s 23.5 degree tilt is much more important. Our North Pole is still tilted very much away from the sun and the sun still takes a very low path across our sky. Therefore, in spite of being as close to the sun as we’ll be all year, we’re going to be quite cold in Houston this week. The latest sunrise of the year (at Houston’s latitude) occurs on Jan. 10. Earth is now just past perihelion, and has sped up a little in its orbit since it is a little closer to the sun. As a result, sunrise, local noon, and sunset have been happening a little later each day since early December. The noon sun is ever so slightly higher at noon each day since the solstice on Dec. 21, but as of today, the sun is still very close to its solstice height. Beginning Jan. 11, the noon sun’s greater height in the sky again becomes the dominant effect (as it is for most of the year). From then until June, sunsets are getting later while sunrises are getting earlier. Jupiter is the brightest thing in the evening sky this month, except for the moon. You can easily see it by looking to the southwest. Jupiter appears lower and lower to the horizon each January night. By the end of the month, Jupiter sets just after 7 p.m. At the end of February, Earth and Jupiter will be on opposite sides of the sun and Jupiter will therefore be invisible to us. Mars has become an evening object. It now rises in the east about 8 p.m. and will rise by dusk at the end of the month. Mars already outshines all stars in the night sky except the very brightest (Sirius), and will continue to brighten throughout January. On Jan. 29, Earth will pass between Mars and the sun, putting Mars in our sky all night long (this alignment is called opposition). 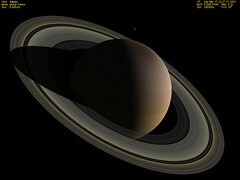 Saturn is currently high in the south at dawn. Although not as bright as Mars this month, Saturn is also brightening as it approaches its own opposition in March. Venus is behind the sun (at superior conjunction) on Jan. 11 and is therefore not visible this month. The Great Square of Pegasus is in the west at dusk. The star in its upper left hand corner is also the head of Andromeda. Facing north, you’ll see five stars in a distinct ‘M’ like shape—this is Cassiopeia, the Queen. Her stars are about as bright as those in the Big Dipper, and she is directly across the North Star from that Dipper. Since the Dipper is low and out of sight at dusk this month, Cassiopeia rides high. Dazzling Orion is high in the southeast, reminding us that winter is here. His belt points up to Aldebaran, the eye of Taurus, the Bull. The Dog Stars Sirius and Procyon are below Orion in the east. Sirius is the brightest star we ever see at night. Gemini, the Twins, are to Orion’s left as he rises (and to his upper left once they appear to the south). Look for two stars of equal brightness less than 5 degrees (three fingers at arms’ length) apart. These are Castor and Pollux, marking the twins’ heads. High in the northeast is Capella, the sixth brightest star ever seen at night. Previous Post Happy Birthday, Isaac Newton!